India and the United States are the world’s two largest democracies with distinguished scientific traditions and experts in a wide range of scientific-technical fields. Given these strengths and the ability to learn from one another, the U.S. National Academy of Sciences together with the National Institute for Advanced Studies in Bangalore, India, held a joint Indian-U.S. workshop to identify and examine potential areas for substantive scientific and technical cooperation that can support counterterrorism efforts through the Homeland Security Dialogue and through direct cooperation. 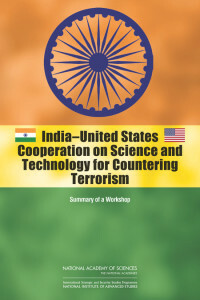 India-United States Cooperation on Science and Technology for Countering Terrorism is the summary of that workshop. This report examines topics such as biological threats; protection of nuclear facilities; security (physical and cyber) for chemicals, chemical facilities and other critical infrastructure; and monitoring, surveillance, and emergency response. The report also identifies and examines promising areas for further Indian-U.S. cooperation.